Tamarind juice is a popular drink in Southeast Asia, India, Mexico, Pacific Islands, South America and East Africa where it was believed to have originated. Tamarind juice is made from tamarind fruit and has a sweet-tangy taste sometimes served with a squeeze of lime. Tamarind in Hindi is popularly known as Imli. There have been several efforts to explain the meaning of tamarind, a word with an Arabic root, however, it is generally described as a tropical African tree which yields tamarind pod used in flavoring Asian cuisines. Scientifically, the botanical name of tamarind is ‘Tamarindus indica’, which identifies tamarind pod as a legume. Due to its high nutritional value, tasty flavor and medicinal benefits, tamarind has become popular across the globe. Other vitamins and minerals found in Tamarind include Vitamin A, C, E, and K. Calcium, Copper, Iron, Magnesium, and Zinc. All these combine to make tamarind a nutritious and healthy fruit. For the health enthusiast, it’s warming to learn that for every 1 serve of the fruit there are 5 calories in tamarind. Tamarind known for its sweet-tart flavor has found many uses. You will find it being used for candies, used in recipes, for sauces, drank as beverages, and even eaten raw. It can be processed into different forms such as tamarind juice – a nutritious drink with numerous health benefits. Tamarind paste – made from the tamarind fruit with the seeds and pod removed. The shiny black colored tamarind seeds are packed with numerous health-enhancing nutrients, vitamins, and minerals which make them valuable in treating different ailments. Due to its anti-inflammatory properties, tamarind seeds are used as a natural remedy to treat a sore throat and other common cold symptoms. To treat a sore throat, either take ground tamarind with warm water or drink tamarind seed juice mixed with cinnamon and ginger. Heavy smokers can use tamarind to remove nicotine deposits on the teeth. 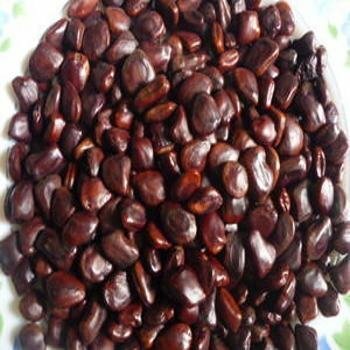 Chewing roasted tamarind seeds also helps to prevent the formation of tartar and plaque formation. The high dietary fiber content improves bowel movement and relieves constipation. Also drinking the tamarind seed juice stimulates bile production which is a natural remedy to cure indigestion. The tamarind seed has immune-boosting elements. These elements stimulate the production of white blood cells that protect the body and fight against diseases. The extracts from tamarind have great skin smoothing benefits. When used as part of a skin care routine, it helps in boosting skin elasticity, hydrates and keeps the skin smooth. Heat the water until it starts boiling. While waiting for the water to boil, remove the pods and draw-out as many strings from the seeds as you possible. Add the sugar and cleaned pod into the water and allow to soak for about an hour and thirty minutes. Use your hands to press out the seeds from the pulp. Add the pulp and liquid in a blender and blend until you have a fine well-blended pulp. You can choose to sieve the drink or leave it as it is. Now that you know the receipe for imli ki chatni you should try to make it at home and reap all the benefits of Tamarind. Health Benefits of Olive Oil (Zaitoon Oil). TheActiveIndian.com is a participant in the Amazon Services LLC Associates Program, an affiliate advertising program designed to provide a means for sites to earn advertising fees by advertising and linking to Amazon.in.